Thus, if 58% of those surveyed said in 2015 that they viewed Sonia Gandhi “favourably”, this has gone up to 65% in 2016. As for Rahul Gandhi, if the survey is to be believed, he has slightly improved his position in one year, from 62 to 63 per cent. Based on face-to-face interviews with 2,464 respondents in 16 states, conducted under the direction of Princeton Survey Research Associates International in April-May 2016, the survey report says, “Eight-in-ten Indians believe their economy is doing well, up 16 points since 2014”, even as admitting there is a deep regional divide. 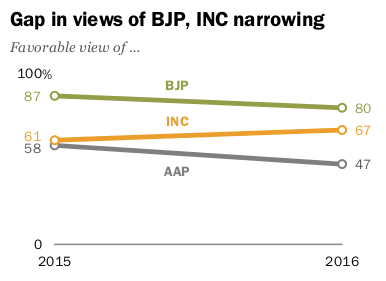 'Two-thirds of the public sees the Indian National Congress party in a favorable light and accords two of the leaders of that party – Sonia Gandhi and Rahul Gandhi – similarly strong favourable ratings." Which two-thirds of indian public would that be .. the ones that laugh at Rahul gandhi speeches?? Dumbass report who dont understand anything about indian political scene.